The holidays are a wonderful time of year for friends and family to gather and celebrate. Whether you’re hosting a holiday meal or having family spend the night, make sure your home is ready for guests. Keep these helpful tips in mind to prepare your house for holiday guests. 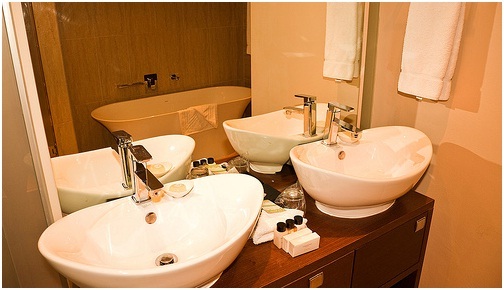 Your bathroom will see a lot of action when guests are over. If you’re hosting a meal, make sure your bathroom has hand soap, hand towels, and extra toilet paper rolls for your guests to use. If you have family spending a few nights, they’ll appreciate a guest bathroom stocked with towels, extra toilet paper, and toiletries they might have forgotten to pack, such as a toothbrush, toothpaste, shampoo, and body wash. If they’ll be using their own bathroom during their visit, you can leave these items in there, but if you’re sharing a bathroom leave them in a basket on their bed. You might think you have enough chairs, plates, and silverware for everyone, but you should double-check before anyone arrives to make sure. You don’t want to find out you’re short on any of these items just as everyone is sitting down to eat. If possible, consider having one or two extra chairs and plates on hand in case an unexpected guest arrives. If your friends or family are visiting for a few days and want to explore where you live, leave them some brochures and local magazines so they can plan their itinerary. This is especially helpful if you have to go to work while they’re visiting. Also, leave them a list of local attractions you think they might like to see and driving directions so they know how to get there. Finally, don’t forget to leave them a spare key so they don’t have to worry about trying to get back inside if you’re not home. There are many important reasons to change your HVAC filters before your guests arrive. A clean filter helps remove dust and other contaminants from your home’s air and improves your indoor air quality. This is especially important if any of your guests suffer from allergies or asthma. Additionally, a clean air filter helps your system run efficiently so your house will feel nice and comfortable for your guests. While you have no issues using that confusing remote control or turning off the alarm system, these are completely new to your guests and could be very confusing. Write down helpful pointers for anything around your house that might be confusing. Also, note important phone numbers that your guests should know if something happens and you’re not home. Having guests over for the holidays is always exciting. By incorporating these tips the next time you have friends or family over, you can ensure that everyone has a comfortable and an enjoyable visit.